With some of the cleanest and more transparent waters in the EU, Malta is quite known for its fantastic and diverse beaches. There are sandy beaches, pebbly beaches, dunes, bays, and steep cliffs. There are beaches for partying, barbecuing, and those where you can just sunbathe and relax. 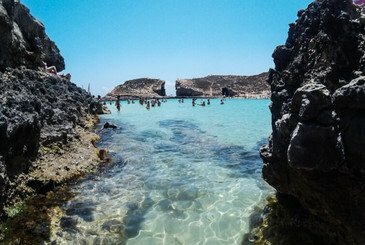 If you’re looking for a worry-free day and you want to stay away from the crowd, there are some awesome locations in Malta you can visit. Here are our top 5 beaches for total relaxation. One of our favorite beaches to escape the crowds is definitely the secluded Selmun Bay. A crystal clear water beach with a quiet atmosphere. Perfect for those days you need to disconnect from the city. Instead, you’ll find yourself connecting with nature –there are no facilities around, and you’ll have to take a long walk before reaching the bay. So remember to pack everything you need (such as food and drinks) for your day at Selmun Bay. Just make sure to check the weather conditions before visiting. There are no lifeguards at Selmun Bay and the current might be really strong. Great for: Snorkeling, Yoga, Photography, or taking your pet for a beach day. 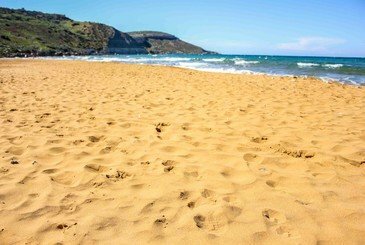 Dig your toes in the sand at Golden Bay, perhaps the most popular sandy beach in Malta. A Blue Flag certified beach with plenty of kiosks and good restaurants with affordable prices for the whole family. It’s one of our favorite spots for catching the most astounding sunsets. Easy to reach by public transport and car. One of the best-kept secrets of Gozo. A golden-reddish sandy beach for extreme relaxation. San Blas Bay is quite a peaceful location that won’t see many visitors because of its limited access –you have to overcome a steep slope to reach the beach. But even though it’s really hard to access, try not to get discouraged. Spending a day at San Blas Bay will lift up your spirits with its awe-inspiring natural views. Great for: Meditation, Photography, Picnic. 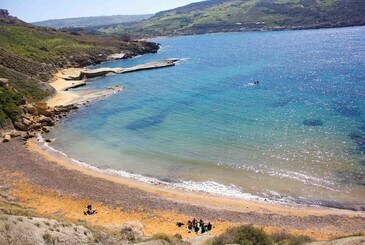 Perhaps Gozo’s best beach. Quite similar sand-wise when compared with the red sand on San Blas Bay. 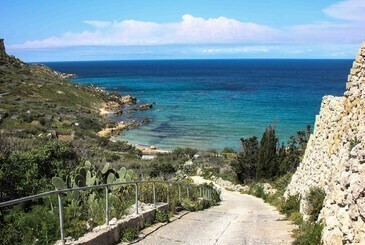 In fact, the name Ir-Ramla il-Ħamra comes from the bay’s golden-reddish sand. 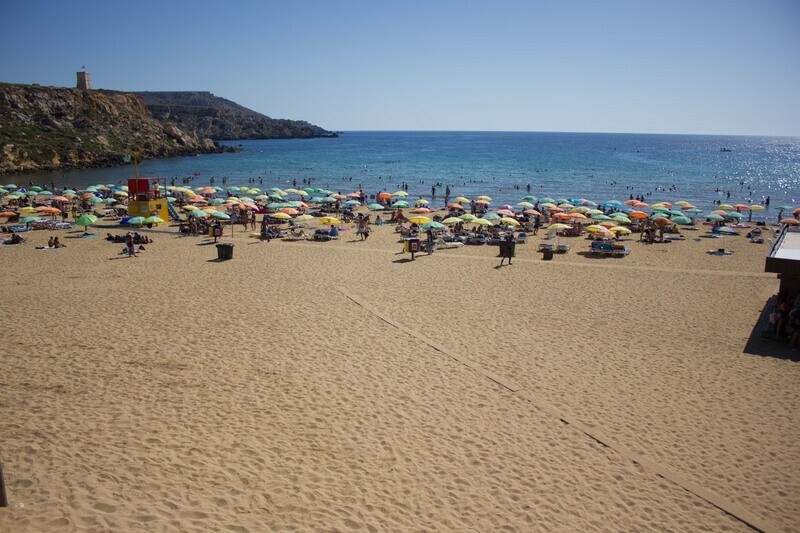 Ramla Bay is great for swimming, snorkeling and sunbathing, and unlike San Blas Bay, it does have one or two cafes and stalls where you can buy some goods. Overall it’s quite a popular beach with easy access and some beautiful views –the hillsides are full of gardens and green hills. Talking about the best beaches in Malta and not mentioning The Blue Lagoon just doesn’t add up. Its crystal clear, cerulean water is quite an eye candy. And yes, we know what you’re thinking. The Blue Lagoon is one of the top tourist attractions in Malta. Why add it to a list of relaxing beaches when it would probably get too crowded? The truth is you can still relax at The Blue Lagoon if you manage to get early to rent a boat. Great for: Chilling at a private boat or camping –there’s a quiet area in Comino where you can escape from the crowds. There are many beaches in Malta for every taste and occasion, and our goal is to help you find the info you need to make your trip to Malta an unforgettable experience. If you liked our list, feel free to share it and invite your friends to discover more about Malta. Did we miss something on our list? Got any other beach you would add to our list? Let us know!